So far the vast majority of posts on the site have focused on the better known US and European dividend stocks. That said there’s a big wide world out there full of interesting companies worth exploring. One that has caught my eye recently is Chinese telecom giant China Mobile (NYSE: CHL), which is one of the largest cell phone service providers in the world with well over 800 million mobile connections and a domestic market share of around 60% . Now, as far as behemoth telecom stocks go the attraction of China Mobile seems fairly obvious. Unlike certain peers in the developed world (e.g. AT&T, Verizon and Vodafone) you’d imagine that the Chinese market offers slightly better organic growth prospects. After all it’s been hard to miss China’s rapid rise to become the world’s second largest economy. More importantly annual wage growth in the country has risen at, or at least very near to, a double digit clip for around two decades now. As Chinese consumers become wealthier their ability to afford services like data hungry 4G cell phone plans should also carry on growing. 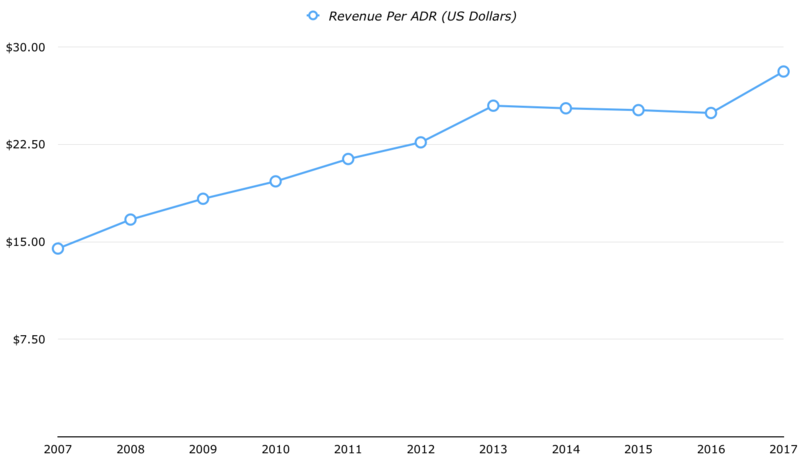 Sure enough if you run over the historical figures you’ll find that China Mobile’s revenue has grown at a respectable rate of around 7% per annum over the past decade or so. Two better reasons to take a closer look at China Mobile are its profitability and current valuation. In terms of the former all the usual metrics stack up with the well known Western blue chips listed above. Though the figure has dropped a bit in recent years it still manages to post an EBITDA margin in the 35%-40% range. Net profit margins are in the mid-teens percentage-wise and it also does a decent job of generating double digit returns on capital despite underlying operations that are naturally asset intensive. As far as the valuation goes you’ll find that China Mobile looks pretty cheap on a relative basis. As it stands the stock trades at around 10x annual earnings with the current dividend yield of 4.5% covered healthily by net income. 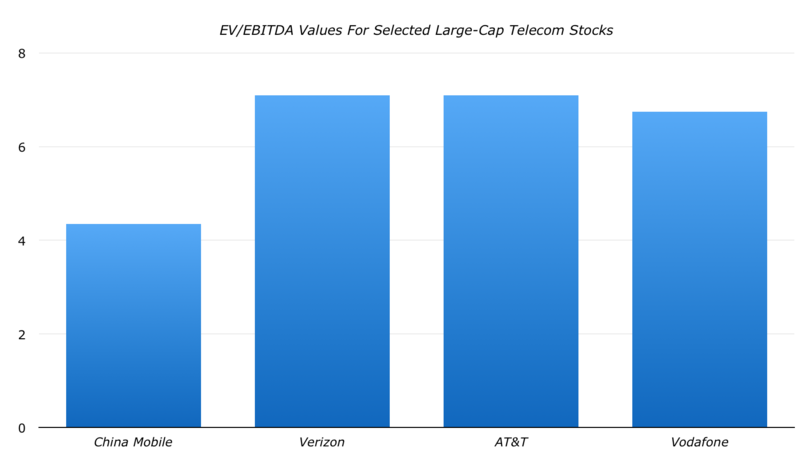 Now, compared to the likes of AT&T and Verizon, which also trade around the 10-11x forward earnings mark, that may not seem particularly interesting. However the difference is much more noticeable once you take their respective balance sheets into consideration. Unusually for a telecom company China Mobile has zero debt and actually sports a net cash position. That represents fortress like strength compared to the likes of AT&T and Verizon, which both have current net debt loads well north of $100 billion, or multinational firm Vodafone, which sits on around $40 billion worth of net debt. If we therefore introduce a debt-adjusted valuation metric such as EV/EBITDA, where EV (enterprise value) represents market capitalization plus net debt, the valuation disparity becomes apparent. China Mobile currently trades at an EV/EBITDA of around 4.5; very cheap when put alongside the roughly 7x EV/EBITDA price tags on offer with AT&T, Verizon and Vodafone. So far so good then. To recap we have a stock that looks cheap, has a stellar balance sheet, throws off a bunch of profit each year and, as far as telecom giants go, has okay growth prospects. The catch is that China Mobile is a state owned enterprise (SOE), with the Chinese state owning just over 70% of shares. Now, in a sense you could argue that this is a positive. In a country that’s not exactly famed for its free markets being on the same side as the state sounds quite reassuring. The flip side, though, is that SOEs are often used to advance government policy goals which may not necessarily align with the interests of shareholders (e.g. state pressure on the company to reduce data fees being a good example). On that note we come to the income proposition. Many investors like telecoms because they see them as “bond proxies”. That is they offer reliable dividend payments at attractive enough yields. 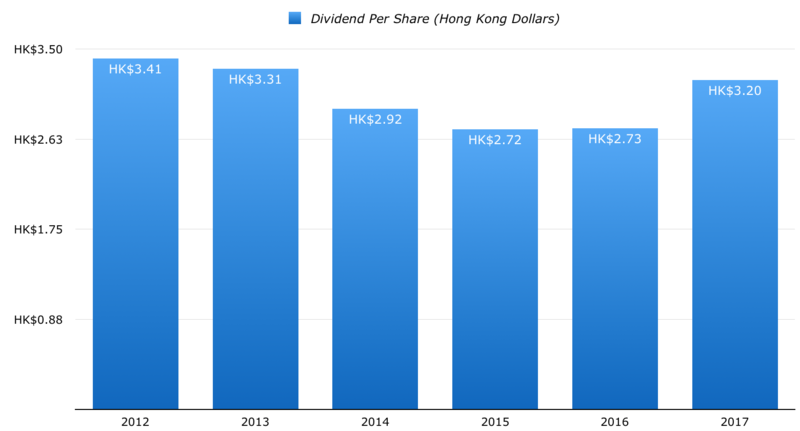 Despite its high quality profits, and in comparison to AT&T’s 30+ year streak of unbroken dividend increases, China Mobile’s recent distribution history looks quite spotty. Though the dividend has actually grown by 16.5% per annum since it was established back in 2002 it is lower now than it was five years ago. Given underlying cashflow hasn’t really fluctuated that much, plus the pristine balance sheet mentioned above, this might seem rather odd. The reality is that this is probably just another consequence of a company not having to prioritize the concerns of private shareholders given the influence of the Chinese state. With that in mind income seekers will probably want to give China Mobile a pass and stick to the more established US and European names. However for those with an eye on value the discount relative to global peers might be enough to warrant a closer look. N.B. China Mobile is listed on the Hong Kong Stock Exchange with American Depository Receipts trading in New York. The current ratio is 5 ordinary shares per ADR.